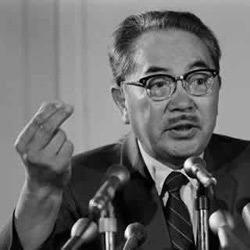 Samuel Ichiye Hayakawa was a Canadian-born American academic and political figure of Japanese ancestry. He was an English professor, and served as president of San Francisco State University and then as United States Senator from California from 1977 to 1983. Born in Vancouver, British Columbia, Canada, he was educated in the public schools of Calgary, Alberta and Winnipeg, Manitoba and received an undergraduate degree from the University of Manitoba in 1927 and graduate degrees in English from McGill University in 1928 and the University of Wisconsin�Madison in 1935.